The emergence of social media has put responsibility for identifying the right offers for recipients and customers in the hands of companies, transforming mass marketing into one-to-one marketing and mass customization whenever possible. Unfortunately, there is no magic answer for the number of segments that a marketer can create. There are, however, some best practices around the different ways to segment. 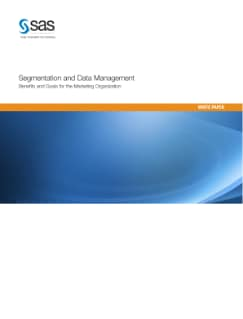 This paper examines the segmentation techniques of profiling, predictive modeling, customer state vector, event-driven marketing and real-time decisioning and explores how all can be used to achieve the overarching goal of maximizing ROI for the organization and elevating the customer experience.